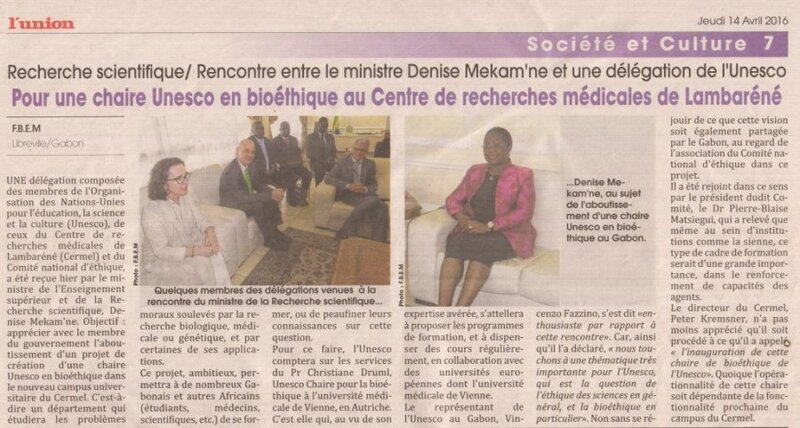 Training in bioethics is now possible in Gabon. The CERMEL campus will host a UNESCO Chair in Bioethics. Signature of a UNESCO Bioethics Chair, Ministry of Education and Scientific Research, April 13, 2016. 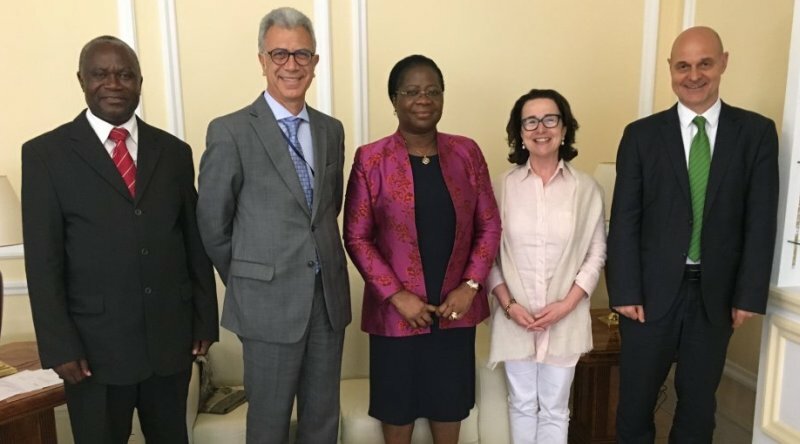 From left to right: Dr. Pierre Blaise MATSIEGUI (Chairman of National Ethics Committee), Mr. Vincenzo FAZZINO (UNESCO, Gabon), Mrs. Denise MEKAM'NE (Ministry of Education and Scientific Research), Professor Christiane DRUML (UNESCO Chair in Bioethics, University of Vienna, Austria),Professor Peter Kremsner (University of Tübingen, Germany and CERMEL, Lambaréné, Gabon). Studying moral problems raised by research involving human beings is an ongoing concern of research. Especially in Sub-Saharan Africa where many concepts are yet to be adapted and deepened. Biomedical research and applications have experienced considerable growth on the African continent in the past 30 years. Gabon is progressing with the establishment of a UNESCO Chair in Bioethics signed on April 13, 2016 between Dr.Pierre Blaise MATSIEGUI, President of the National Ethics Committee Libreville, Mr. Vincenzo FAZZINO, UNESCO Representative Gabon and Professor Peter Kremsner, Director of the Insitute for Tropical Medicine, Tübingen, Germany and CERMEL, Lambaréné in the presence of Madame Denise MEKAM'NE, Minister of Education and Scientific Research. "The opening of this Bioethics Chair" is an important step for the CERMEL campus, said Professor Peter Kremsner in an interview in the newspaper “l’Union” on Thursday, April 14, 2016.